A bill that would reinstate a commission counties receive in return for their collection of state motor vehicle tax was advanced from general file April 16. Bellevue Sen. Sue Crawford, sponsor of LB237, said county treasurers currently may withhold 2.5 percent of the first $3,000 in state motor vehicle sales and use tax that they remit, which amounts to $75 per month. Under LB237, counties also could withhold 0.5 percent of all amounts in excess of $3,000 remitted each month. Seventy-five percent would be deposited in the county general fund and 25 percent would be deposited in the county road fund. Crawford said the Legislature eliminated the 0.5 percent commission on amounts over $3,000 during a state budget crisis in the early 2000s. She said counties collect more than $200 million in state motor vehicle sales tax each year and need the additional commission to cover the cost of collecting that tax. According to the state Department of Revenue, LB237 would cut revenue to the state’s Highway Allocation Fund, which in turn would decrease the amount of those funds distributed to cities and counties. However, the department estimates that counties would receive a net revenue increase of $467,000 in fiscal year 2019-20 and $1.2 million in FY2020-21 due to the additional commission. A Revenue Committee amendment, adopted 36-0, would require county treasurers in counties with a population of 150,000 or more to remit $1 of the collection fee for each of the first 5,000 motor vehicles, semitrailers or trailers registered on or after Oct. 1, 2019, to the state treasurer, who would credit the amount to the department in order to defray the bill’s implementation cost. Crawford introduced an amendment, adopted 33-2, that would allow counties to withhold 0.5 percent of all amounts in excess of $6,000 remitted each month rather than $3,000. She said the change would ensure that no counties lose revenue under the proposal. Sen. Megan Hunt of Omaha supported the bill. According to the Douglas County treasurer, she said, state motor vehicle tax collection is one of the most labor intensive services that his office is required to provide. Last year, Douglas County remitted more than $60 million in motor vehicle tax revenue to the state, she said. “The total amount that they get from the state to do the work of collecting all those taxes is only $900,” Hunt said. Gering Sen. John Stinner said he was concerned about the proposal’s effect on cities. Under Crawford’s amendment, he said, counties either would receive additional revenue or be held harmless. Cities, however, would lose approximately $400,000 in distributions from the Highway Allocation Fund, he said. Stinner said he also felt conflicted about cutting revenue to the state’s Highway Cash Fund, which is used to fund state highway construction projects. Sen. Mike Groene of North Platte opposed LB237, saying the additional commission is unnecessary. Counties already receive enough property tax revenue to fund their operations, he said. 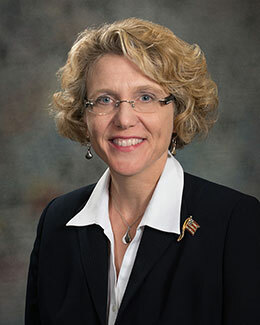 Thurston Sen. Joni Albrecht also opposed the bill. She introduced an amendment that would have directed 50 percent of the revenue from the proposed 0.5 percent commission to a county’s road fund, rather than 25 percent. It failed on a vote of 21-6. Senators voted 29-6 to advance LB237 to select file.